Dynamic Bodywork is a great stand-alone method as well as a very adaptable supplemental approach to your existing manual therapy work and/or movement practice. ​Movement is the essence of life and our bodies are built for it. 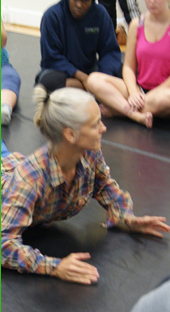 We seek to understand the structures and the mechanisms of movement. The Dynamic Bodywork modality is based on the premise that understanding and maintaining proper alignment has significant effects on myo-fascial health, and thereby on the healing outcomes of manual therapy in the long term. In Dynamic Bodywork, movement and touch are experienced simultaneously to benefit each other and intensify the building of neural pathways and reorganizing the body map. We seek to heighten our awareness of the body's function and the complex interplay of the collaborating structures, to maintain or re-instate freedom of movement, fluidity, and ease, to support healthy posture, and to reduce myo-fascial pain at any age. Dynamic Bodywork is a holistic approach to movement and manual therapy, taking into consideration the physical and psychological benefits of creative expression and the individuality of each body. Dynamic Bodywork goes beyond the idea that movement is to be applied in the form of an exercise regimen or that creativity could be separate from everyday life. 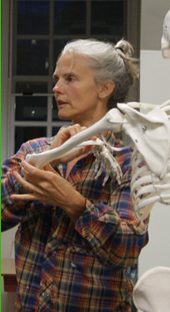 Dynamic Bodywork is not rooted in corrective exercise, rather, in understanding the principles of anatomical and bio-mechanical function, which allows the mover (client and therapist) to develop a more comprehensive sensitivity and kinesthetic awareness of their body in motion while empowering them to take a leadership role in their own healing process on a daily basis. Dynamic Bodywork - introduction/Live/6 CEU's/DB explains the foundation on which the modality is built upon, and gives insight into basic hands-on techniques. 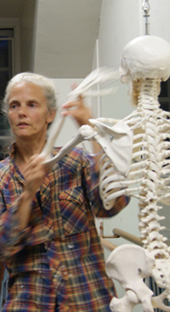 ​This 6hr/6CEU comprehensive workshop/lab is broken down into theory, discussion, kinesthtetic exploration, and hands-on Dynamic Bodywork application. The Introduction course offers a broad overview of principles while giving you more than a handful of specific tools to practice. We study basic aspects of anatomy, physiology and biomechanics of the body in motion and focus on giving ourselves time to embody the principles explored. We discuss the movement possibilities at the joints and search for those pathways that are structurally sound, energy efficient, cooperative and creatively organic. We address individual restrictions such as those related to hyper- or hypo flexibility, individual differences in bone structure, and others. After experiencing movement and range of motion on our own bodies we begin to integrate manual therapy with gentle and restorative movement. You will come away from this experience with a basic understanding of the Dynamic Bodywork modality and its underlying approach to movement. You will be given the tools to improve general mobility, body awareness, and sensitivity, and a kinesthetic understanding of movement and its place in our everyday lives. This Dynamic Bodywork course will give you new tools to work with your clients, and simple approaches for your clients to work in between sessions with you. No movement/exercise/sports knowledge or background is needed. Participants should be able to walk, sit, stand and lay down without major discomfort. If movement is impaired in any way, please contact me to discuss if this workshop is for you or if another workshop is more applicable to your current abilities and situation. A group of very mixed backgrounds is expected and not a problem. Must be a licensed massage therapist to take this course. Wear stretchy, loose clothing that keeps you comfortable and that does not restrict movement in any way. Layer up so you can adjust to varying degrees of warmth (tank top, t-shirt, long sleeved shirt, longer pants, socks, for example). Bring water and snacks. Please take off your jewelry and don't wear perfume. No oils or lotions will be used. Be prepared to move, write, receive and give manual therapy. Bring Yoga mats, blankets, pillows, bolsters, if you have, if not, don't worry, I will provide everything you need for this workshop. Dynamic Bodywork - axial skeleton/Live/ 6 CEU's/DB focuses on the function of the spine (and the benefits of intrinsically initiated movements), walking, sitting and laying down. This workshop gives many hands on opportunities to help integrate movement with manual therapy. This 6hr/6CEU comprehensive workshop/lab is broken down into theory, discussion, kinesthtetic exploration, and hands-on Dynamic Bodywork application. The Axial Skeleton course offers a closer look at the function of the spine, giving you more than a handful of specific tools to practice. We study basic aspects of anatomy, physiology and biomechanics of the spine in motion and focus on giving ourselves time to embody the principles explored. We look at the movement possibilities at the joints and search for those pathways that are structurally sound, energy efficient, cooperative and creatively organic. Our goal is to gently free the spine to allow subtle movements to occur and transmit forces efficiently through the spine from the axial skeleton, breath, and heartbeat to the periphery and back. We look at the role that the spine plays in movements such as walking, sitting and laying down. ​We address individual restrictions such as those related to hyper- or hypo flexibility, individual differences in bone structure, and others. You will come away from this experience a deepened understanding of the Dynamic Bodywork modality and its underlying approach to movement. You will be given the tools to improve general mobility, body awareness, and sensitivity, and a kinesthetic understanding of movement and its place in our everyday lives. This Dynamic Bodywork course will give you new tools to work with your clients, and simple approaches for your clients to work in between sessions with you. No movement/exercise or sports knowledge or background is needed. Participants should be able to walk, sit, stand and lay down without major discomfort. If movement is impaired in any way, please contact me to discuss if this workshop is for you or if another workshop is more applicable to your current abilities and situation. A group of very mixed backgrounds is expected and not a problem. Dynamic Bodywork - appendicular skeleton /Live/ 6 CEU's/DB focuses on function of the periphery and its interplay with the axial skeleton. This workshop also gives ample opportunities for hands-on exploration and opens the door to more dynamically complex creative client-practitioner interaction. The Appendicular Skeleton course offers a closer look at the role of the appendicular compensations as potential kinetic energy storage, as initiators, counterweights, or balance aids. We compare appendicularly driven movements with axially driven movements. This course also offers a good handful of tools to practice. We study active and passive ROM of the extremities, and look at shoulder and hip anatomy, physiology and biomechanics. We spend a good amount of time with the arches of the hands and feet and with tool sallowing our hands and arms to bear weight. We give ourselves time to embody the principles explored. We look at the movement possibilities of the joints and search for those pathways that are structurally sound, energy efficient, cooperative and creatively organic. Our goal is to understand how the shoulder and hip interplay with the spine to allow for a structurally sound alignment that facilitates resilience and mobility at once. You will come away from this experience with a kinesthetic appreciation for the complexity of the human body and the confidence to trust your body to explore and eventually teach itself to find and maintain alignment. You will gain a deeper understanding of the Dynamic Bodywork modality and its underlying approach to movement. You will be given the tools to improve general mobility, body awareness, and sensitivity, and a kinesthetic understanding of movement and its place in our everyday lives. This Dynamic Bodywork course will give you new tools to work with your clients, and simple approaches for your clients to work in between sessions with you. BII - The Body's Intrinsic Intelligence: Natural Movement Principles – Preserving the body's structures for life-long freedom of movement. This introductory workshop series consists of five three-hour modules that can be taken separately for 3 CEU's each (in any or the suggested order) or as a whole for a total of 15 CEU's. The suggested order is day 1: introduction, day 2: walking, day 3: horizontal locomotion, day 4: level changes, day 5: creative integration. 'Creative Integration' is not suitable as a stand-alone workshop. INTRODUCTION: Foundations for Dynamic Bodywork - Introductory series/BII-The Body's Intrinsic Intelligence/INTRODUCTION/3CEU's/Live gives a general introduction and lays the foundation for following BII courses. Focuses on theory and simple exercises to convey the philosophy and approach. WALKING: Foundations for Dynamic Bodywork - Introductory series/BII-The Body's Intrinsic Intelligence/WALKING/3CEU's/Live examines walking mechanics, the gait cycle and transitions from simple walking to creative walking and dancing as well as controlled and irregular surfaces (outdoor excursions). Investigates how walking illustrates the underlying principle of all movement. HORIZONTAL LOCOMOTION: Foundations for Dynamic Bodywork - Introductory series/BII-The Body's Intrinsic Intelligence/HORIZONTAL LOCOMOTION/3CEU's/Live examines other, more challenging, options of locomotion besides walking. Horizontal locomotion includes, rolling, walking on all fours, crawling, etc. LEVEL CHANGES: Foundations for Dynamic Bodywork - Introductory series/BII-The Body's Intrinsic Intelligence/LEVEL CHANGES/3CEU's/Live analyzes the complexity of the challenges we are faced with when we desire to get from standing to sitting to laying down and back up; an essential piece of knowledge for anyone, at any age. 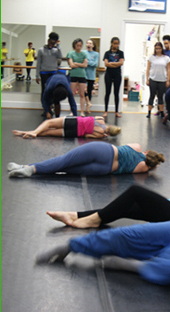 CREATIVE INTEGRATION: Foundations for Dynamic Bodywork - Introductory series/BII-The Body's Intrinsic Intelligence/CREATIVE INTEGRATION/3CEU's/Live allows for playful application of principles explored during days 1-4. Day 5 acts as a review as well as allows us to deepen our understanding of specific topics or challenges as they relate to individual workshop participants. We focus on the intersection of movement and manual therapy and how BII informs Dynamic Bodywork outcomes. 'BII – The Body's Intrinsic Intelligence', as the foundation for the Dynamic Bodywork modality, seeks to investigate and practice a way of moving that is in harmony with the body's natural design and that allows for optimal structural integrity, coordination, cooperation and ease. By refining our own kinesthetic skills we lay the foundation for analyzing movement patterns and challenges in our clients. We explore movement from the inside out, investigating the interplay of the body’s individual components, with a focus on energy conservation, injury prevention, and reducing myo-fascial pain and general stiffness. Goal of this workshop is to refine our understanding of alignment and increase our ability to maintain it. Benefits of BII practice extend to both the practitioner and the client. for this series is a general fitness level. No dance or exercise background is required. 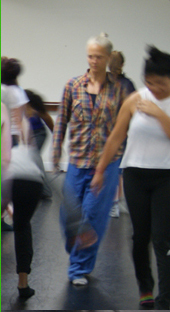 The course is open to people from all levels of movement experience, novice to professional. People with movement impairment or dysfunction can be integrated (please contact dynbod@gmail.com in advance). BII – THE BODY'S INTRINSIC INTELLIGENCE is a modality that analyzes human movement, both in theory and practice. 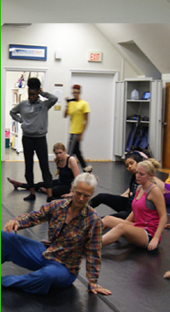 Every class is a carefully designed web of exercises and improvisations that inspire body awareness and help develop an internal, intellectual, and kinesthetic understanding of the human body in motion. Movement is the essence of life and our bodies are built for it. Understanding and maintaining proper alignment has significant effects on myo-fascial health, and thereby on the healing outcomes of manual therapy in the long term. Movement is the basis for the Dynamic Bodywork modality and therefore this introductory series focuses on that important aspect. kinesthetic sensitivity and the ability to demonstrate movement principles to our clients. Naturally, benefits of BII also extend to us, the practitioners, as it helps us observe our own posture and movement patterns while working with our clients as well as in everyday life. to use movement for meditation and as a tool for mindfulness. to reduce myo-fascial pain at any age. BII is not an exercise regimen and it is not corrective exercise; rather it is an individualized approach to sensing and re-evaluating our movement choices and habits for what we feel is useful to our movement goals, which could lead to re-organizing our body-map, or to adding vocabulary to our movement dictionary. BII is investigative and inquisitive; it is not prescriptive or manipulative. The workshop format is that of a lab and remains open to addressing specific interests or needs as they are brought up by individual participants. BII emphasizes that the mover is an intelligent, informed and self governed human being. Wear stretchy, loose clothing that keeps you comfortable and that does not restrict movement in any way. Layer up so you can adjust to varying degrees of warmth. Long sleeved shirts and long pants are better for sliding and rolling across the floor. We do not wear shoes, we move barefoot and we protect them and keep them warm with socks. Please bring pen and paper. My work is profoundly inspired by studies with the Axis Syllabus. I encourage you to take a workshop and/or get the book.